Across the street from the Cloisters, the terraced Versailles Gardens are a delicious oasis of stillness and silence within walking distance of the busy Atlantis Resort. Despite the huge number of people who come to Paradise Island for their vacations, very few abandon the beaches, pools, and casino to relax in the perfumed splendor of these gardens. 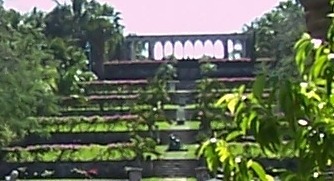 The terraces descend from The Cloisters, at the south end, to the exquisite Mother and Child statue in the center. 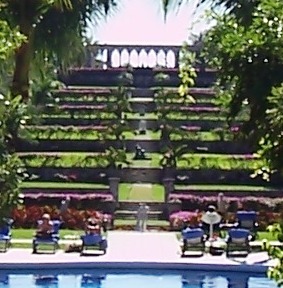 The terraces then begin to ascend again, culminating in the One & Only Ocean Club’s lovely Versailles Pool. Many other statues placed around the gardens represent characters such as Hercules, Napoleon, Franklin Roosevelt, and David Livingstone.